The Resident Commissioner of Puerto Rico, Pedro Pierluisi, yesterday reintroduced the "Puerto Rico Chapter 9 Uniformity Act" to amend the Bankruptcy Code to include Puerto Rico as a "State" for purposes of who may be a debtor under chapter 9 of the Bankruptcy Code. According to an analysis from Ferraiuoli LLC, this inclusion would allow for the restructuring of public debt by insolvent government-owned corporations in Puerto Rico. State governments are not eligible to adjust their debts under chapter 9 of the Bankruptcy Code, but a "political subdivision or public agency or instrumentality of a State" can adjust its debts under chapter 9 if authorized by state law. Pierluisi had introduced the "Puerto Rico Chapter 9 Uniformity Act of 2014" during the 113th Congress on July 31, 2014. The measure was referred to the Subcommittee on Regulatory Reform, Commercial and Antitrust Law, but it did not advance. The new bill, H.R. 870, was referred to the House Judiciary Committee and is scheduled for a hearing later this month. To read the full analysis, please click here. To read the full text of H.R. 870, please click here. In related news, Puerto Rico's recent economic woes are primarily short-term shocks from some tough decisions that are being made in order to put Puerto Rico on a path toward long-term success, according to a CNBC commentary. After years of profligate spending, Puerto Rico's overall debt burden is roughly $70 billion, which amounts to approximately 70 percent of the island's GDP. However, not all of its public debt is actually guaranteed by the government, for the most part, debt held by public corporations, such as electric utility PREPA, is not guaranteed, and the government recently acted to erase any perception of an implicit guarantee of that debt, according to the commentary. That leaves only about $40 billion in debt that is constitutionally guaranteed or supported by taxes, or roughly 40 percent of Puerto Rico's GDP, which is quite manageable by sovereign standards. The average debt-to-GDP ratio in the EU is more than twice that amount, and in Greece it's more than five times that amount. Read the full commentary. New research shows that the country's rate of new business creation, which peaked about decade ago, plunged more than 30 percent during the 2007-08 economic collapse and has been slow to bounce back ever since, the Washington Post reported today. The trend continues despite the fact that, over the last few years, the portion of the U.S. population between the ages of 25 and 55 — historically the prime years for starting a business — has been expanding, according to data compiled by the Kauffman Foundation, an entrepreneurship research organization. Not surprisingly, fewer new businesses means fewer new jobs. Mark Zandi, chief economist at Moody's Analytics, cited Labor Department statistics showing that companies less than one year old contributed 5.2 million jobs in the year ending June 2014, down from the usual 6 million or so they generated in the years leading up to the recession and well off the normal pace of 7 million to 7.5 million jobs a year that was seen in the 1990s. Read more. Although Wall Street lobbied aggressively and succeeded late last year in persuading lawmakers to roll back rules for the $700 trillion derivatives market, the victory sparked a populist uprising among Democrats that has wide-ranging consequences, including stymieing less-controversial requests from regional banks like Capital One Financial Corp., Bloomberg News reported today. Financial companies and their employees spent $169 million on the November elections and had expectations that their bid to loosen regulations would get easier with Republicans in control of both the House and Senate. Now, there is second-guessing that banks overplayed their hand, according to lobbyists. The December win on swaps rules has become a rallying cry for Sen. Elizabeth Warren (D-Mass.) and spurred repeated White House vows to defend Dodd-Frank. A sign of the political headwinds has been regional banks' difficulty winning bipartisan support for a bill that would free them from stringent oversight imposed on lenders with at least $50 billion of assets. Capital One reportedly considers getting the threshold increased a top legislative goal this year. The company's inability to persuade Democrats to lead the charge in the Senate, particularly home state Sen. Mark Warner (D-Va.), has reverberated through the ranks of financial lobbyists. The message is clear that Warren's attacks on the industry have made even moderate Democrats skittish to stand up for banks, according to insiders. Read more. Goldman Sachs released an analysis yesterday that shows that the culprit in the oil crash has been an abundance of oil flooding the market, Bloomberg News reported yesterday. A massive supply shock in the second half of last year accounted for most of the decline, and in December and January, slowing demand contributed to the continued sell-off. Oversupply shocks picked up beginning in 2012 as U.S. shale-oil production exceeded expectations, culminating in a piercing shock of oversupply last year that sent markets reeling. "[T]he decline in oil has been driven by an oversupplied global oil market," wrote Goldman economist Sven Jari Stehn. As a result, "the new equilibrium price of oil will likely be much lower than over the past decade." Read more. The American College of Bankruptcy (ACB) Fourth Circuit will be holding a free program, "Considering ABI's Report on Chapter 11 Reform," on Capitol Hill on Feb. 13. The program will last from 9:30 a.m. to 1:00 p.m. and be located in Room 226 of the Rayburn House Office Building (House Judiciary Committee). Members are invited to attend the discussion by ABI commissioners and bankruptcy experts on the Final Report’s treatment of small and medium-sized enterprises (SMEs), 363 sales, valuation and more. For more information and to register, please click here. ORDER YOUR PRINTED COPY OF THE FINAL REPORT OF ABI'S COMMISSION TO STUDY THE REFORM OF CHAPTER 11! Order your printed copy of the Final Report of ABI's Commission to Study the Reform of Chapter 11! The 402-page Final Report contains more than 200 discrete recommendations of chapter 11 policy reforms. 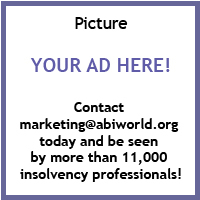 ABI's Commission to Study the Reform of Chapter 11 was established in 2012 with a mission to study and propose reforms to Chapter 11 of the Bankruptcy Code and related statutory provisions. After months of deliberations, the Commission unanimously adopted this report to provide to Congress. For the special price of $40, you will have all the testimony, studies and figures that went into compiling the recommendations at your fingertips! Click here to order. Make sure to save the date for "Pension Tension: Dealing with Plans in the Restructuring World," the new ABI Live Webinar scheduled for Feb. 26 from noon - 1:15 p.m. EST! This webinar, presented by ABI’s Labor and Employment Committee, will address current employee- and labor-related issues in chapter 11 and out-of-court restructurings, including, among other things: (a) whether private equity sponsors may be subject to pension fund withdrawal liability under ERISA in light of the First Circuit’s Sun Capital decision; (b) whether pension plan withdrawal liability is entitled to administrative claim status; and (c) the status of the Pension Benefit Guaranty Corp.’s moratorium on 4062(e) enforcement. Attorneys and other restructuring professionals dealing with the PBGC will learn about current developments in this dynamic and changing area of law that plays an important role in many reorganizations today. The Ninth Circuit ruled that a chapter 11 debtor's plan may not classify an undersecured creditor's claim as entirely secured unless the creditor itself makes the section 1111(b)(2) election. There are more than 1,500 appellate opinions summarized on Volo, and summaries typically appear within 24 hours of the ruling. Click here regularly to view the latest case summaries on ABI's Volo website. A recent blog post looks at the Supreme Court's consideration of Bank of America, N.A. v. Caulkett and Bank of America, N.A. v. Toledo-Cardona. In both Caulkett and Toledo-Cardona, the Supreme Court is being asked to reverse decisions of the U.S. Court of Appeals for the Eleventh Circuit, which affirmed decisions of the lower courts allowing the individual chapter 7 debtors to "strip off" the junior liens on their homes when their respective first-priority mortgages were underwater. The Court has scheduled oral argument on the cases for March 24. 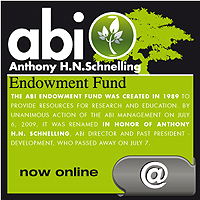 To read more on this blog and all others on the ABI Blog Exchange, please click here. INSOL International is a worldwide federation of national associations for accountants and lawyers who specialize in turnaround and insolvency. There are currently 43 member associations worldwide with more than 9,000 professionals participating as members of INSOL International. As a member association of INSOL, ABI's members receive a discounted subscription rate. See ABI's enrollment page for details. Have a Twitter, Facebook or LinkedIn Account? Join our networks to expand yours. Feb. 13, 2015 Washington, D.C.
ABI Live Webinar: "Pension Tension: Dealing with Plans in the Restructuring World"
ABI Live Consumer Webinar: "Student Loan Update"
Feb. 13, 2015 | Washington, D.C.
- ABI Live Webinar: "Pension Tension: Dealing with Plans in the Restructuring World"
March 5-7, 2015 | Tampa, Fla.
- ABI Live Consumer Webinar: "Student Loan Update"
March 24, 2015 | Los Angeles, Calif.
April 16-19, 2015 | Washington, D.C.
May 7-8, 2015 | Uncasville, Conn.
May 14, 2015 | New York, N.Y.
May 17-21, 2015 | New York, N.Y.
May 19-22, 2015 | Chicago, Ill.